I went to one of Vancouver’s food institutions for lunch today. You know what I mean, Stepho’s, Sophies, Hy’s Steakhouse all fall under this category. The places that are so popular, always packed, have looked the same since the beginning of time. And all but Hy’s, in my opinion, have a reputation that far exceeds the quality of their food. People say about these types of places, “but they’re always packed, which means they must be good”,or “but they serve such big portions”. Both mean nothing in my mind, because as was reinforced today, places can be popular in spite of their food. Nick’s Spaghetti House is on Commercial Drive. Serving Vancouver for over 53 years, (as said on their menu), the interior looked like it probably did 53 years ago, with wood paneled walls and red checkered table cloths adding to its “charm”. The menu is old school, lasagnas, ribs&pasta, chicken&pasta, steak&pasta. 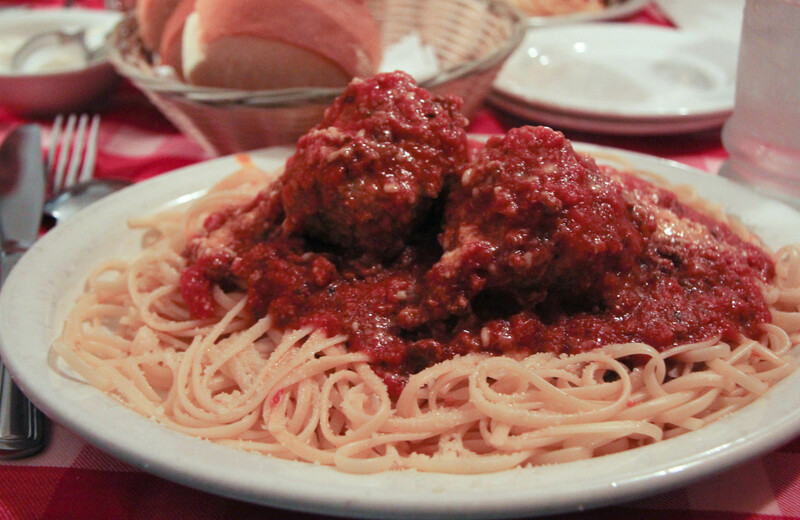 But because it’s called Nick’s Spaghetti House, I had to order the spaghetti with meatballs. Not a lot of light & so much red on the plate made this a difficult one to shoot. Out of 15 attempts, not 1 super clear pic. I need to remember to use live view on my new camera for a better angle of the food. How was is? A pool of water under the pasta disappointed me, because it watered down the sauce. There was also just too much pasta for not enough sauce. The meatball was the best part, it was moist and flavorful and I probably would have been happy to just have the 2 meatballs, no pasta. That’s a sad thought for a place called a Spaghetti House. Absolutely agree- water under the pasta. I like their atmosphere. I agree with the “institution” comment. Like the Elbow Room! Wait in line to be yelled at and serve mediocre food!! Not for me.